Little did I know that Scotland would end up being one of my favorite countries. Known as one of the most beautiful places in the world, Scotland never failed to mesmerise. From the moment I alighted the bus at 6am and walked up the winding, cobbled streets of Edinburgh in search of the famous Castle Rock hostel, I knew this was going to be special. The first thing I noticed about Edinburgh was its enchanting beauty. The little alleys and medieval squares, the castles and the Gothic architecture which was clearly visible in most of its buildings. 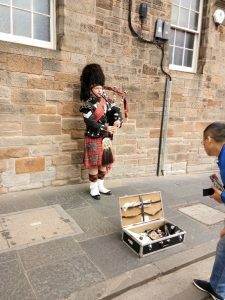 While some parts of the city gave a modern feel to it, the charm of the old Edinburgh and the pleasant sound of pipers playing their bagpipes permeates the whole city. One of the real allures of Edinburgh is that it is easily walkable, making you trip over the history where ever you go. I started my day opting to take a Sanderman’s tour. For those of you who don’t know what I’m referring to, Sanderman tours are walking tours that happen all across major cities in Europe. The guides are spectacular with their theatrics and narrative skills and take you around their city, giving you the dates, taking you back in the day, sharing tips for best places to shop and eat and answer questions one may have regarding their city. Well, I kick started the day with a cup of hot coffee to keep me warm and energised for the 2.5 hours free walking tour around Edinburgh. Our guide was simply wonderful and I learnt a lot about Edinburgh’s history from him. 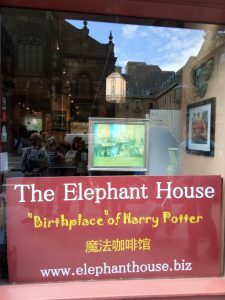 We visited the famous spot from where J.K. Rowling got her inspiration to write her very first Harry Porter, Elephant Café where she penned Harry Porter, the Grassmarket area full of cafes and bars, Arthur Seat, Calton Hill, St. Giles Cathedral and wandered through narrow alleyways each with a tale of its own. 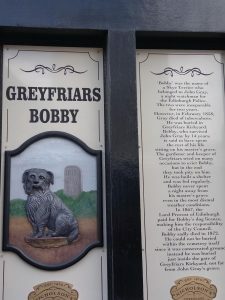 We stopped by the statue of Edinburgh’s most loved resident – a little Skye terrier ‘Greyfriars Bobby’, who faithfully guarded his owner’s grave in the nearby Greyfriars Kirkyard for fourteen years. Edinburgh’s most popular and famous attraction, the Castle dominates the skyline. An ancient stronghold, it has been home to royalty for hundreds of years. Not missing the opportunity, I spent the afternoon wandering through the castle, taking in its history, walking through the ancient dungeons and reminiscing the centuries gone by. Every Sunday the crowds gather for the shooting of the One O’clock Gun, a tradition dating back to the 1800s. 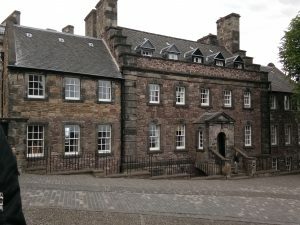 As the evening set in and the temperatures dropped significantly, I started rubbing my arms vigorously, slipping on a nice warm jacket, I headed for the Dark Tour another one of the Edinburgh’s famous tours of ghostly tales and sinister stories. A group of us, with a hilarious guide, set off along the path of graveyards and hills, cemeteries and haunted alleys, hearing stories of witchcraft and body snatching, public executions and gruesome jails, deadly tortures and the story of the real Dr Jekyll and Mr Hyde inspired by Deacon Brodie a respectable Scotsman who had a secret life as a criminal. Still brings shivers when I think about it. For quick meals I chose local pubs on and off the Royal Mile. While not exactly a mile long, the Royal Mile is a festivity of shops, local pubs, famous among it being Deacon Brodies Tavern with a fascinating tale of robbery, deceit and public execution behind it. 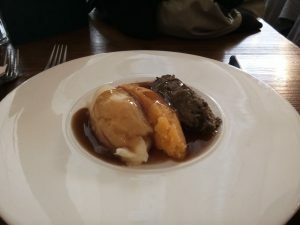 While I feasted on haggis from Howies and black pudding at every opportunity, I enjoyed the Scottish salmon, mussels and other varieties of sea food, Scotland being known for its coastal delights. 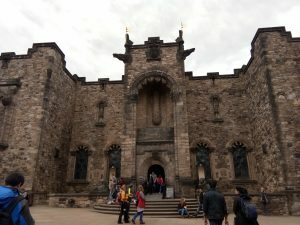 • Visit Edinburgh Castle: The city’s main landmark, although it cost £ 17, is certainly worth the visit. From up here, you can also enjoy magnificent views of the ocean and the city. • Whisky Tour: Known the world over, no visit to Scotland is complete without a Scotch Whisky Experience. Learn how whisky is made, understand the subtle flavours and years that go into maturing it and complete the tour with whisky tasting. Edinburgh will always hold a special place in my heart, opening up its arms, embracing me, allowing me to share in its glorious history, damp weather, cultural festivities, breathtakingly gorgeous views and its insane whisky. Previous Post:My love affair with the English Countryside!